This textbook offers architects around the globe a new and unique approach to formulate and visualize Architecture Principles much more effective at strategic level. This book is very useful for people who work in the field of Business Development, Information Management, System Development and Information Technology. What is the textbook about? Within the enterprise architecture discipline much value is attached to 'architecture principle' as an instrument to support the design and implementation of an integrated business / IT solution, and of an enterprise or parts thereof. 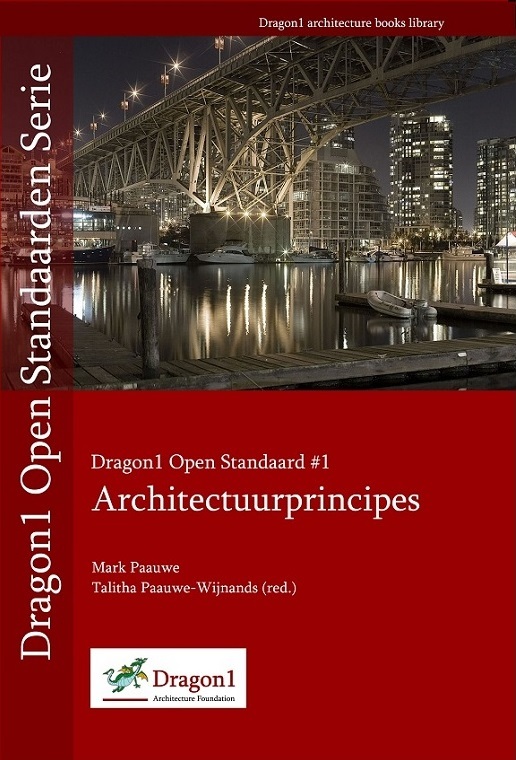 This Dragon1 open standard book describes how to formulate and visualize architecture principles and how to make effective use of this instrument for example, in projects for the design and implementation of systems or structures. "Using architecture principles to ensure the operation of the retained business and IT concepts in the company at a strategic level"
"Using architecture principles for knowledge retention"
"Using architecture principles communication of knowledge, vision, policy and strategy"
A benefit of using the Dragon1 EA Method? Realistic visualizations of current and planned architecture is a powerful technique for owners/clients, stakeholders, users, program managers and specialists to reach a common understanding (insights and overview) of architecture analysis and design within a short period of time as needed to realize and implement integrated and sustainable (future proof) business IT solutions. Dragon1 provides an Enterprise Architecture framework of guiding principles, a consistent glossary of defined architecture terms, reference models, an extensive library of symbols and several defined professional products. In Dragon1, principles are about the way things work; architectures are designed as total concepts and architects are the creative designers of an integrated solution. With this approach, Dragon1 offers a full palette of practical aides including checklists, templates, symbols and design rules. Reference models in the Dragon1 EA Framework are available to quickly define one’s own Enterprise Architecture. Dragon1 is both a cloud-based EA Software Tool and an open EA Method. This textbook about Architecture Principles is very useful for creating visualizations of principles and concepts in an EA Tool, especially when using the Dragon1 EA Tool. Order a paperback or full color copy of the Dutch version of Architectuurprincipes here at Bol.com.